By Gordon Frickers this marine painting measures 30 x 121 cms (12″ x 48″). Sold. Available as a ‘Heritage‘ print, on canvas for the look and feel of an original, numbered edition, signed. The large version looks awesome ! “a forest of masts“, as described in diaries, letters and log books. Trafalgar Dawn places you on-board the flagship among the crew members as that fateful day began. 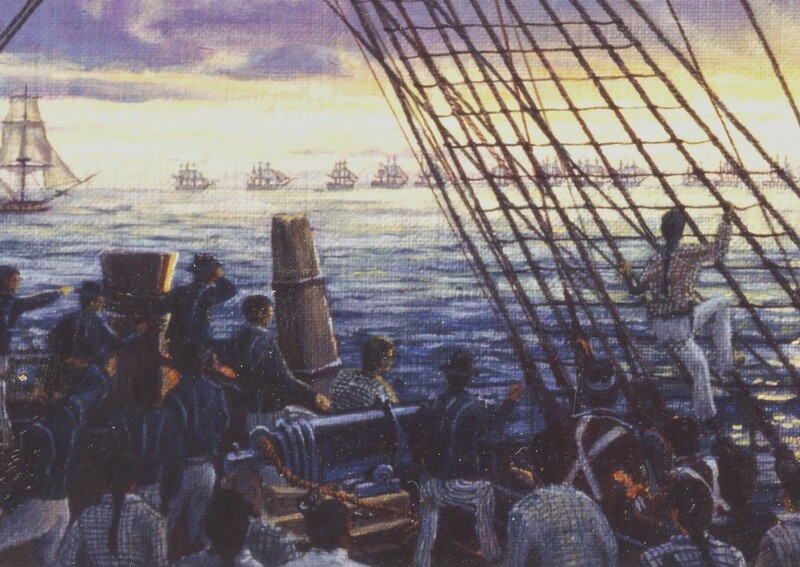 “Trafalgar Dawn” besides being a impressive and memorable painting is an historical document researched right down to the way ropes were twisted (rope laid or shroud laid) the men’s hairstyles and cloth, has been reproduced in several authoritative books so there you have several reasons this painting has an outstanding haunting ‘presence’. “I was awoken by the crew rushing on deck and by their cheering“. You can ‘click’ on the image above or the images below to see more detail. 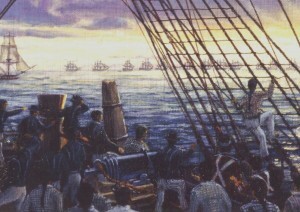 Five minutes after this informal moment depicted, at 06.10, the British attack began in earnest with Nelson’s first signal of the day to his fleet. By carefully examining the French and Spanish documents while visiting the archives of those countries it was possible to establish the exact order of the ships on that horizon. For your enjoyment each name is reproduced under the appropriate ship on the Heritage prints we supply which you can order via this web site, from the Print Gallery on the taskbar above. This scene is based on eyewitness accounts, journals of men from both fleets, ship’s log books and sketches made at the time therefore the words of the men present at the time. The movements of the men, their positions, body language, cloths & even hair styles result from very extensive research, as is the equipment, appearance & position of Victory & the other ships depicted. All is as historically accurate as diligent research could make it at the time. As mentioned on his cv/ résumée Gordon Frickers worked officially for HMS Victory, his paintings used to help raise funds towards the renovation to 1805 condition of HMS Victory, work supervised by the now legendary Mr. Peter Goodwin. 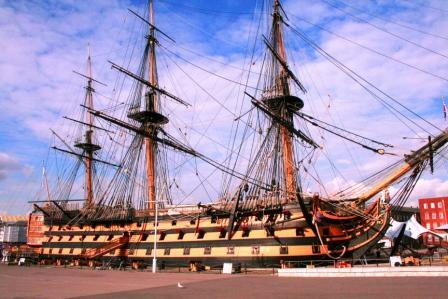 “most original and memorable” ~ Peter Goodwin, Curator and Keeper, HMS Victory, June 1996. The picture is for the moment still available as a Heritage print, numbered, signed, own, enjoy.